"Last week I watched in horror as a 20-something girl carefully snapped a photo of a basket of onions," said Oleksinski. "But we weren't at a serene farm or the Marché d'Aligre in Paris — we were crammed into the Columbus Circle Whole Foods. Thousands of customers were streaming through the aisle trying to grab some garlic for their dinners, and Little Miss Annie Leibovitz was blocking traffic to get some artsy snaps of nightshades. Will she print out these photos? Nope. A pile of white spheres under fluorescent light is even too dull for Instagram. Next time, Annie, take a breath and think about where you are . . . Pay for your brie wrap and vamoose." Oleksinski isn't alone. Modern professionals are finding a suffocating relationship with technology has left them oblivious to social basics their elders took for granted. 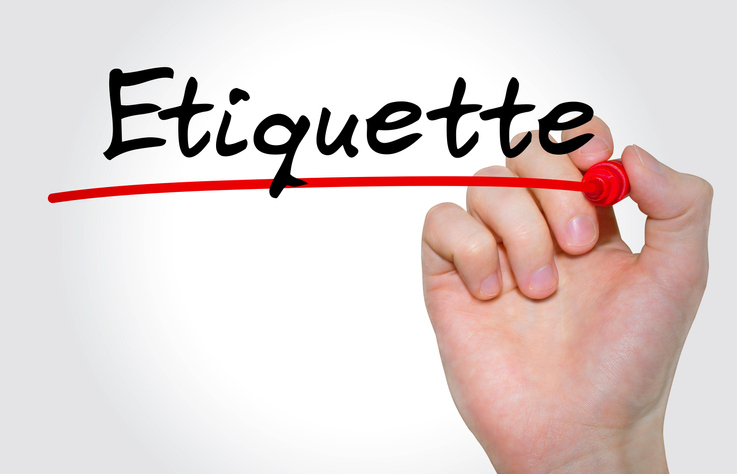 "Etiquette is so much a part of your brand," said Rachel Isgar, a Phoenix-based etiquette coach and author. "Just a few improvements can help your career." People respond to people, and poor manners may mean a hindered partnership, a missed promotion, or a collapsed deal. Companies like Beaumont Etiquette, which runs a marquee "finishing program" in the Plaza Hotel of Manhattan, have recognized a unique need for social training in the modern generation. 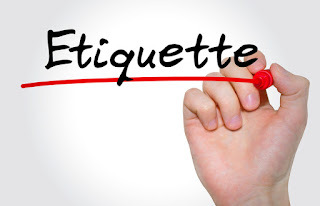 "Even if it was not something you were taught as a child, anyone can learn to have good etiquette, and it's up to you to teach yourself," founder Myka Meiers said. "I think, sadly, people become very self-involved . . . and forget about others. What I wish these people could learn is that by spending just a little time each day making someone else happy and spreading kindness, even the smallest gesture, their lives could be so much more fulfilled." Meiers says honoring others includes everything from table manners to Twitter posts. Just as we once taught people to "think before you speak," how much more crucial should it be to "think before you post?" "If you don't want your grandmother or your boss to read it, don't post it," Meiers said. "Once it's on the web, it's out there for good." Never ignore those you're with to make a call or text. Don't post work-related complaints on social media. Never post on social media while you're under the influence. Don't place your phone on the table during meetings. Don't text people about work outside of normal office hours. Don't dehumanize cashiers by using your phone while someone serves you. "Manners are really reflections of core principles," Daniel says. "Consideration, respect and honesty."